Digital x-ray is a standard diagnostic technique, frequently ordered for any joint complaint. X-rays are used to determine the existence of fractures, joint dislocations and for suspicion of arthritis or osteonecrosis. 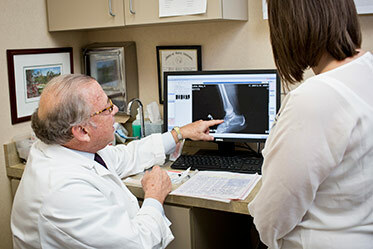 At Guilford Orthopaedic and Sports Medicine Center, we take great care to make your x-ray experience as comfortable as possible. Our skilled technologists will gently position the area of your body to be imaged between the x-ray machine and digital film. The level of radiation exposure from x-rays is minimal, and from the x-ray results, we are able to better assess and address the particular cause of your joint pain. Read more on x-ray options by clicking here.